The Media Lab's new lab space—which we call the "YellowBox"— is devoted to our group's exploration of novel materials, device design, and fabrication strategies to create micro- and nanoscale electromechanical systems with mechanically adaptive features, which allow intimate integration with the objects of interest. Watch this time-lapse video of the YellowBox cleanroom's construction. Credit: MIT Media Lab /Jimmy Day. 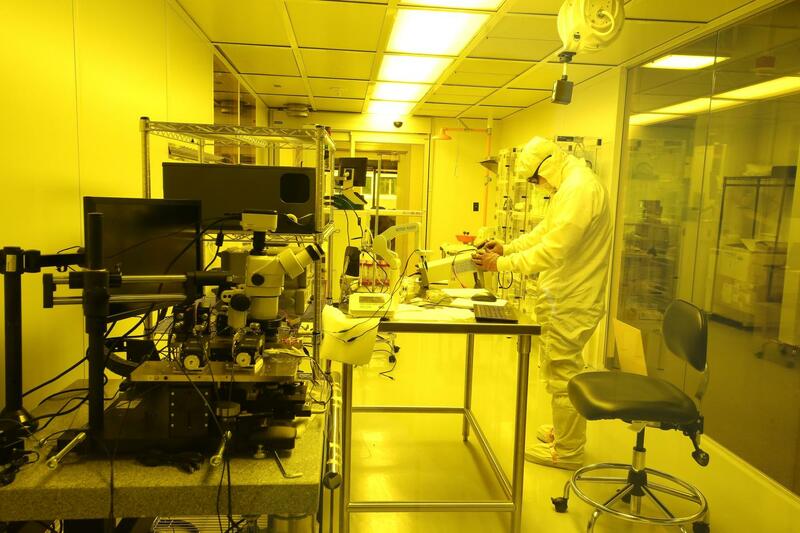 YellowBox is the first-of-its-kind cleanroom built inside the Media Lab, and the key facility to accomplish the Conformable Decoders group's research endeavors. The physically transparent YellowBox has glass walls, is equipped with cameras to track researchers and processes in real time, and has a special operation room ("the chase") to manipulate and hack traditional microfabrication tools for our evolving research needs. YellowBox consists of three major components: a gowning area, a specimen preparation room of Class 10,000 of approximately 300 sq. ft., and a cleanroom of Class 1,000 of approximately 400 sq. ft.
vented specimen and chemical storage cabinets. 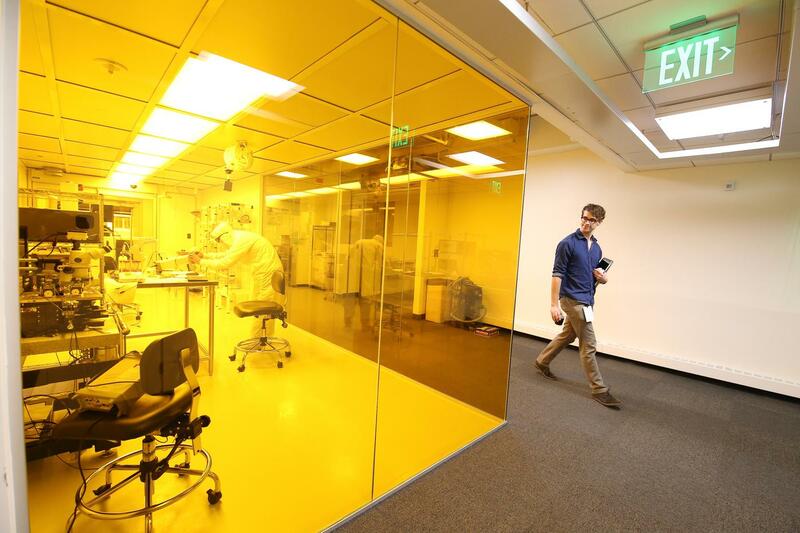 A view of the YellowBox clean room at MIT Media Lab. The Conformable Decoders’ YellowBox is a unique lab for creating unusual electromechanical and electrochemical systems in that the processing flows and the floor layout is optimized for the use of both traditional and non-traditional materials. Spin coating of (a) photoresist and (b) silicone-based materials are executed on separate spin coater units. The entire facility is kept under UV filtered light, allowing researchers to freely move between spaces to access specialized fabrication characterization equipment, without the risk of yield loss due to accidental photoresist exposure. This is why the cleanroom is yellow and its nickname is YellowBox. YellowBox is supported by an administrative assistant and a cleanroom laboratory manager with experience in microfabrication operations and development environments. 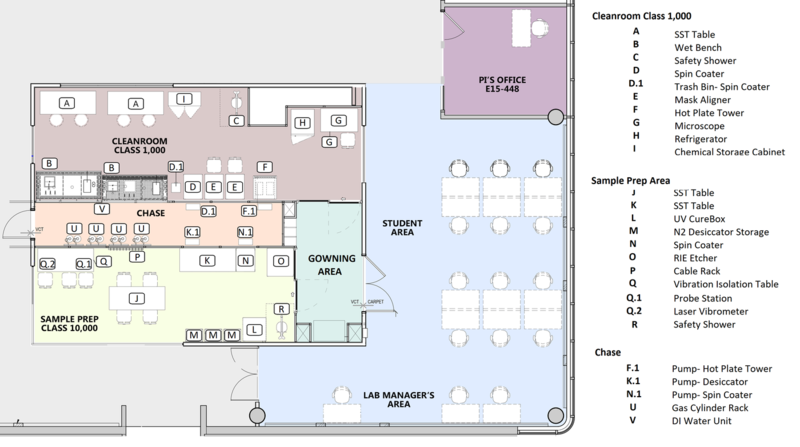 A floor plan of the YellowBox lab used by Conformable Decoders researchers. The gowning room entry is secured and access is granted via proximity Key Card access for authorized users. A Laboratory Information Management System (LIMS) tracks both user access to the cleanroom and equipment reservations, including processing logs to record experiment data for later review. Users sign in via an iPad mounted near the room's entrance. The gowning room is kept clean to Class 10,000 standards by HEPA filters above. Inside the gowning area, a Garment Storage Cabinet securely houses and separates the Class 1,000 garments from the Class 10,000 garments to prevent cross-contamination. A nearby stainless steel bench enables users to sit down while gowning up, and a small stainless steel table allows users to conveniently wipe down items before bringing them into the cleanroom. A large mirror is conveniently mounted near the gowning bench, for users to ensure their garments are donned properly. Independent access to both cleanroom spaces is provided to both (a) the Class 10,000 Specimen Preparation area and (b) the Class 1,000 Cleanroom Microfabrication area by passing through sliding glass doors, which are activated by a proximity sensor. Access to the Class 10,000 Specimen Preparation area is permitted for users wearing lab coats, while access to the Class 1,000 Cleanroom Microfabrication area requires complete gowning. The cleanroom garments are washable, and the facility uses a laundry service approximately every three weeks. Conformable Decoders researchers suited up for access to the YellowBox lab: (l-r) David Sadat, Irmandy Wicaksono, Carlos Nunez Lopez, Canan Dagdeviren, Atieh Sadraei, and Mohamed Zijun. The polypropylene wet bench is intended for use in photoresist developing. The wet bench is used to etch devices in acids, including but not limited to hydrofluoric acid (HF), hydrochloric acid (HCl), nitric acid (HNO3), buffered oxide etch (BOE), gold (Au) etchant, and chromium (Cr) etchant. There are two 25 sq. ft. tables for use during device preparation activities. The spin coater in the Class 1,000 cleanroom space is used to spin coat substrates of various sizes with photoresist. The Mask Aligner #1 is located immediately adjacent to the spin coater. It is used for alignment of the photoresist-coated substrate to the photo-mask, and the controlled UV exposure of the photoresist film. As well, it's used as a pick-and-place tool during the transfer-printing process. The Mask Aligner #2, also near the spin coater, is used for alignment of the photoresist-coated substrate to the photo-mask, and the controlled UV exposure of the photoresist film. This stainless steel tower houses multiple hot plates, with the hot plates housed inside the tower to exhaust the surrounding air and prevent particles from settling onto the devices during baking. The vacuum oven is a 12.5 L unit that operates under vacuum and vents to a facilities exhaust. The optical microscope is conveniently located near the mask aligners and includes many features, including polarization, an image capture system, and advanced image analysis software to view the contrast between thin film device layers. 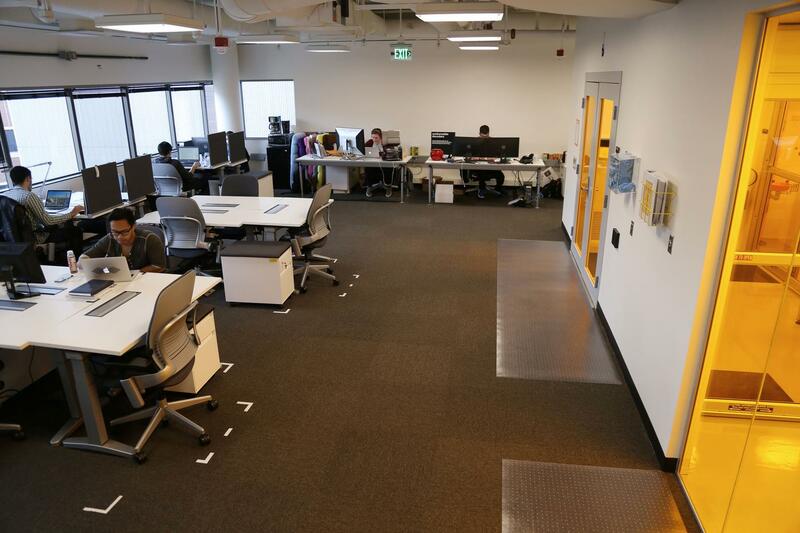 The YellowBox (at right) is conveniently located close to the office area of the Conformable Decoders group at the MIT Media Lab. The probe station is an easy to use and highly precise manual probe platform for wafers and substrates up to 150 mm, with a vibration-isolation table to protect quality over the measurement duration. The lock-in amplifier is used to detect and measure very small AC signals. The digital storage oscilloscope is a compact tool for digital, real-time sampling of electronic signals. This arbitrary waveform generator provides both a full set of standard waveforms and custom waveform generation. The precision LCR meter enables the best combination of accuracy, speed, and versatility for a wide range of component measurements. The semiconductor parameter analyzer delivers synchronizing current-voltage (I-V), capacitance-voltage (C-V), and ultra-fast pulsed I-V measurements. The laser vibrometer is a sophisticated measurement tool for the analysis and visualization of structural vibrations and surface topography in microstructures and devices. The reactive ion etcher affords etching capabilities over a variety of materials and substrates for non-caustic etching. It can also be easily expanded to etch various materials by adding new gas lines. The pH meter continuously measures pH and records the data digitally. There are two 20 sq. ft. tables, used during device preparation activities. Retractable power receptacles are mounted on the ceiling above the sample preparation tables. The nitrogen-purged clear acrylic cabinet-style desiccators store sensitive items. A Conformable Decoders Lab researcher at work in the YellowBox. The chase is essentially the heart and operation center for the YellowBox. It is isolated from users/researchers, and all adjustable gauges, controls, valves, and switches are accessed in the service chase by authorized personnel only. The glass walls give a complete view of the Class 1,000 and Class 10,000 spaces without the need to gown up and enter the cleanroom environment. Gases are supplied to the cleanroom via compressed gas cylinders with a control system for automatically switching out of empty gas cylinders to prevent interruptions to cleanroom operations. Gases used currently include ultra-high purity argon, nitrogen, oxygen, and CF4. More gases can be added or removed as the needs of the Conformable Decoders research group change. The facilities supplied from the chase to the wet benches include process vacuum, nitrogen, compressed dry air, and deionized water. Deionized water is supplied to the wet benches (Type 1, ~18 MOhms), and the wet bench hoods are exhausted for low concentration, corrosive fumes generated by pouring small quantities of acids and developers. We believe that digestion is vital in the heart, brain, and stomach: we digest knowledge in the brain, passion in the heart, and food in the stomach to design and create novel biomedical devices that can affect our bodies and explore the organs. This is the magic of our YellowBox. 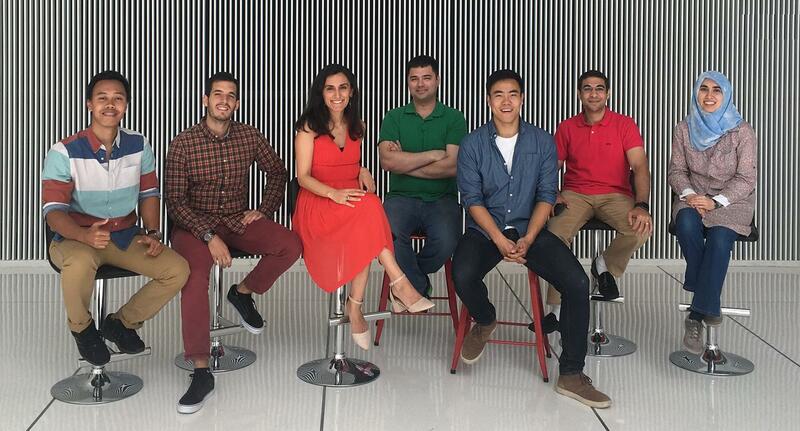 Members of the Conformable Decoders group: (l-r) Irmandy Wicaksono, Carlos Nunez Lopez, Canan Dagdeviren, David Sadat, Zijun Wei, Mohamed Ghoneim, and Atieh Sadraei.